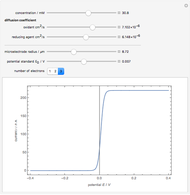 Cyclic voltammetry is one of the principal techniques in electrochemistry. 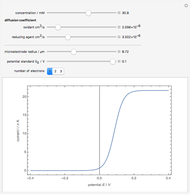 This Demonstration shows a simulation of cyclic voltammetry on a microelectrode in steady state and with reversible kinetics. 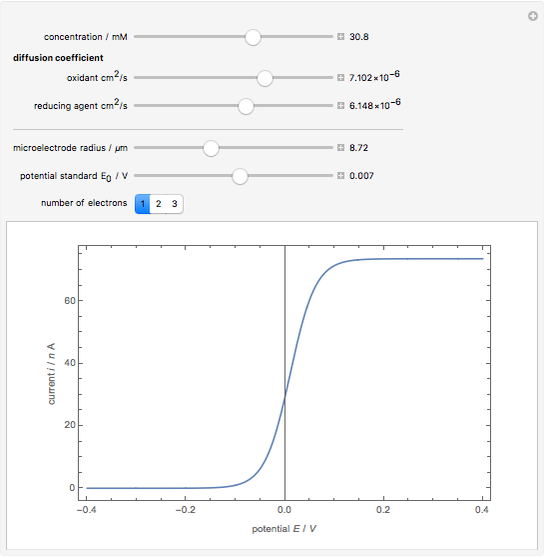 At the microelectrode, the redox reaction occurs: . 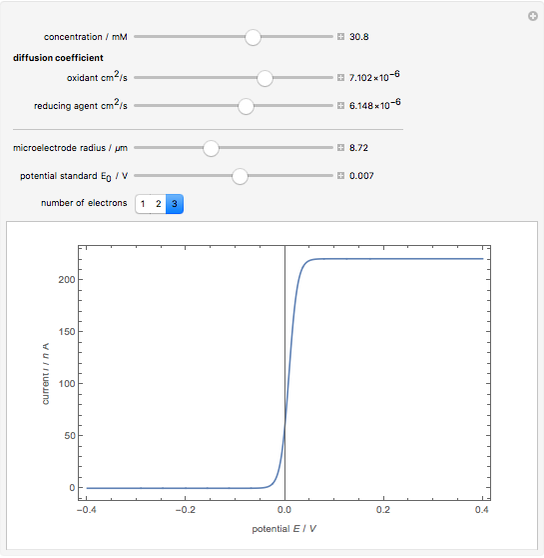 Because the microelectrode is very small, the steady state is quickly attained. 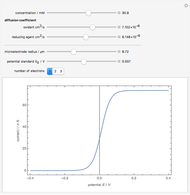 If the standard rate constant of the reaction redox on the microelectrode is very rapid ( ), we have a reversible voltammogram. 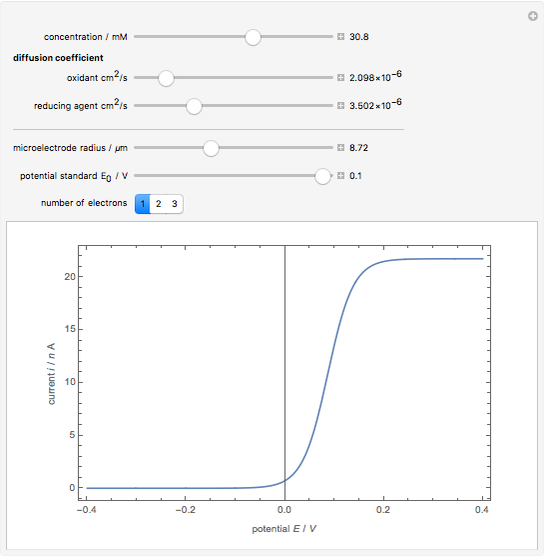 According to , the reversible steady-state voltammogram satisfies the equation , where is the limiting current of the microelectrode, , ( ) is the diffusion coefficient of the oxidant and reducer, ( m) is the radius of the microelectrode, (V) is the standard potential of reaction redox, (V) is the applied potential, is the gas constant , is the Faraday constant (C/mol), C (mol/L) is the concentration of oxidant, (K) is the temperature, and is the number of electrons transferred. A. M. Bond, K. B. Oldham, and C. G. Zoski, "Theory of Electrochemical Processes at an Inlaid Disc Microelectrode under Steady-State Conditions," J. Electroanal. Chem., 245(1–2), 1988 p. 71. Quang-Dao Trinh "Reversible Steady-State Voltammograms at Microelectrodes"
Simulation Domain for a Microelectrode: Is It Large Enough?